Revive Our Hearts is excited to announce a strategic ministry alliance with Pure Freedom, the ministry of Dannah Gresh. As part of this alliance, Secret Keeper Girl will become True Girl, reflecting a shared desire to call women of all ages to freedom, fullness, and fruitfulness in Christ. Find out more at MyTrueGirl.com. Her eyes are slanted in angry disposition, but it is apparent that they are a beautiful, deep blue. Her nose is tiny and perky. “Soft” would best describe her dewy skin, which is gently marked with a few tender freckles. Her hair is strawberry blonde and beautiful. Jenny’s physical attributes would make her an all-American poster child, but there is no brightness in her face, as there should be for a ten-year-old girl. Her mom explains the problem. Jenny is certainly not overweight, but is a healthy weight for her age. Not underweight or over. Just right. She would best be described as athletic. Since Jenny isn’t talking and her mom is, someone ironically volunteers to take Jenny for some cake in the other room. “What do you think about your weight,” we ask when Jenny is out of earshot. If only that story were fiction. It’s not. That happened at one of the Lies Girls Believe focus groups. I wanted to be in touch with the parenting reality of today’s moms of girls aged eight to twelve, so I travelled across the country to facilitate focus groups with them. Then I asked them this: “If you said ‘yes,’ how do you feel about that part of your body or face?” Twenty-eight percent said they also did not like the same part of their own body or face. Seventeen percent were uncertain. The realization hit us all hard. It’s one thing to hope and believe that our daughters won’t face the same beauty battles we have. It’s quite another to consider the fact that we may actually be introducing her to the fight. How I feel about my body won’t impact her. According to a Wall Street Journal article, one study found that 80 percent of ten-year-old girls had already been on diets to lose weight. Anorexia and bulimia are on the rise. This study was referenced in an article linking the ways mothers think about their own bodies to the aftermath of adult women’s beliefs about theirs. Thirty to forty percent of women think about body image every day, and almost half of them say it is because their mothers did. They resent their mothers for it. Lies we believe are easily passed on to our daughters. When it comes to body image and beauty, Truth is better caught than taught. I know you have no problem reading Psalm 139 and believing that your girl is “fearfully and wonderfully made,” but do you believe it about you? Of course, I don’t think our biggest concerns for our daughters should be lies about beauty. We should be most concerned about lies about God. But apparently we really aren’t. Another question I asked moms in my focus groups was this: “What kinds of lies are you most concerned about?” The number one category was “self-esteem,” with 32 percent stating it was their greatest concern. I followed that up with this question: “What does your daughter struggle with that you did not struggle with when you were her age?” I emphasized that I wasn’t asking what the moms feared would be a problem, but what currently was a problem in their daughters’ lives. Their number one answer: self-entitlement. At 23 percent of respondents, this was the runaway leader. On one hand, moms were asking us to help their daughters have more self-esteem. On the other hand, moms recognized that their daughters struggle with self-entitlement. The most important thing about raising girls is protecting their self-esteem. Actually, the most important thing about raising girls is not what they feel about themselves, but what God says. One thing became clear to me. We’re often easily confused when it comes to how we teach our daughters Truth and what topics matter most. At least, that’s the conclusion I came to for myself as a mom of two beautiful daughters. 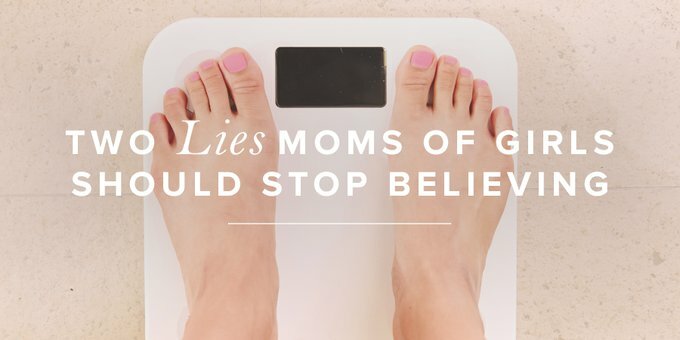 Doing this research helped me see more clearly, and I hope it will help many moms do the same as they read the full report of my work in A Mom’s Guide To Lies Girls Believe. Because if we cannot see the Truth, we’ll have a hard time teaching it to our girls. Your daughter does not need self-esteem. She needs God-esteem. If she understands who God is, she will understand her own value but not make too much of it. Let’s join together to grow up a generation of women who make much of God and less of ourselves. PS: Do you want to study the Bible with your eight- to twelve-year-old girl in an effort to plant Truth deep into her heart? Join me and Chizzy Anderson on Monday nights in March and April for a six-week online Bible study for tween girls and their moms using Lies Girls Believe. Register before February 17 and your daughter will receive a T-shirt!